A couple friend of mine from Tandag, Surigao del Sur came to Manila to find a new suppliers of shoes and bags. After 2 days, they were finished with their business and came to visit us. They arrived in the warehouse just in time for our dismissal. We stayed for an hour in the canteen for a small chitchat with our boss, who happens to know them too a few years back. Donna and Ferdie brought 4 boxes of Krispy Kreme for the kids but after talking and looking at the boxes, we were tempted to open it. And indeed we finished one box. I gave one box for my brother as he was leaving for Bulacan. The rest of the donuts, I brought home! It was simply delicious! Surprisingly! 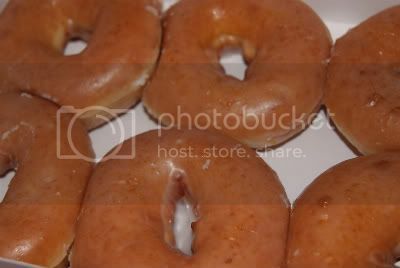 Krispy Kreme is too sweet for me, that's why whenever we go there, I always order the plain one. U-uh...It looks delicious. Personally I really love spicy food, but I always appreciate a good skill from a chef who made the food with all his or her heart. I'll share this recipe in my facebook. 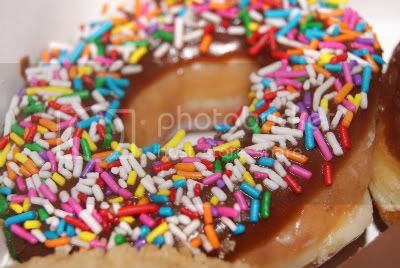 I love Krispy Kreme Donuts and they are the best ever! !